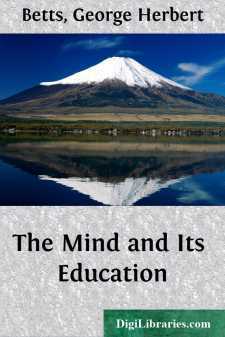 We are to study the mind and its education; but how? It is easy to understand how we may investigate the great world of material things about us; for we can see it, touch it, weigh it, or measure it. But how are we to discover the nature of the mind, or come to know the processes by which consciousness works? For mind is intangible; we cannot see it, feel it, taste it, or handle it. Mind belongs not to the realm of matter which is known to the senses, but to the realm of spirit, which the senses can never grasp. And yet the mind can be known and studied as truly and as scientifically as can the world of matter. Let us first of all see how this can be done. The Personal Character of Consciousness.—Mind can be observed and known. But each one can know directly only his own mind, and not another's. You and I may look into each other's face and there guess the meaning that lies back of the smile or frown or flash of the eye, and so read something of the mind's activity. But neither directly meets the other's mind. I may learn to recognize your features, know your voice, respond to the clasp of your hand; but the mind, the consciousness, which does your thinking and feels your joys and sorrows, I can never know completely. Indeed I can never know your mind at all except through your bodily acts and expressions. Nor is there any way in which you can reveal your mind, your spiritual self, to me except through these means. It follows therefore that only you can ever know you and only I can ever know I in any first-hand and immediate way. Between your consciousness and mine there exists a wide gap that cannot be bridged. Each of us lives apart. We are like ships that pass and hail each other in passing but do not touch. We may work together, live together, come to love or hate each other, and yet our inmost selves forever stand alone. They must live their own lives, think their own thoughts, and arrive at their own destiny. Introspection the Only Means of Discovering Nature of Consciousness.—What, then, is mind? What is the thing that we call consciousness? No mere definition can ever make it clearer than it is at this moment to each of us. The only way to know what mind is, is to look in upon our own consciousness and observe what is transpiring there. In the language of the psychologist, we must introspect. For one can never come to understand the nature of mind and its laws of working by listening to lectures or reading text books alone. There is no psychology in the text, but only in your living, flowing stream of thought and mine. True, the lecture and the book may tell us what to look for when we introspect, and how to understand what we find. But the statements and descriptions about our minds must be verified by our own observation and experience before they become vital truth to us.